Residents will get their first look today at the new Blue Bikes about to hit the streets of Boston, Cambridge, Brookline and Somerville, as part of the Metro Boston public bike share system’s new partnership with Blue Cross Blue Shield of Massachusetts (“Blue Cross”). The six-year agreement will build on the success of the Hubway system and greatly expand access to bike share in the four municipalities. Blue Cross’ support also will allow for upgrades to the system overall, including new bikes, new mobile app features, and more valet service to guarantee bikes at busy stations. Metro Boston public bike share system becomes Blue Bikes this month. 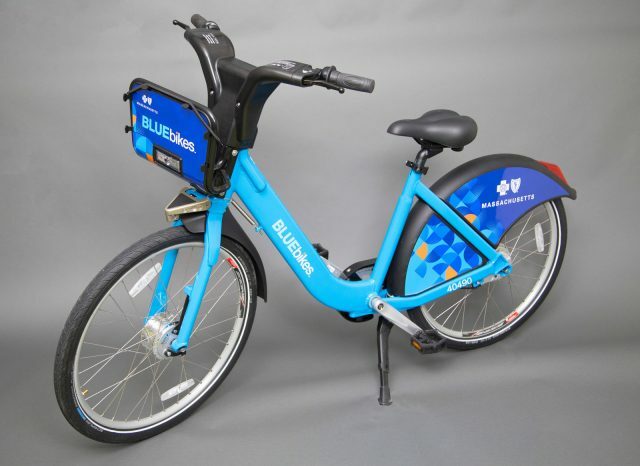 As part of the sponsorship, the existing system is being rebranded as Blue Bikes, reflecting Blue Cross’s support for the bike share system, which will continue to be a municipally-owned, public transportation system and to be operated by Motivate International, Inc. By the end of 2019, there will be 3,000 Blue Bikes on the streets — up from the 1,800 that exist today — and more than 100 new stations throughout the four municipalities. the infinity shifter, allowing for continuous shifting across a wider range of gears. The transition to Blue Bikes is now officially underway, with the first batch of new bikes rolling onto streets today. All bikes, stations, webpages, and the mobile app will reflect the new Blue Bikes branding by May 16. For a limited time, as part of the Blue Bikes launch, riders can save $15 on an annual membership. And, for the first time, riders will now have the option of purchasing a single ride fare for $2.50. To celebrate the launch of Blue Bikes and National Bike to Work Day, Blue Cross will sponsor a “Free Ride Day” on Friday, May 18, to encourage new users to take the bikes for a spin free of charge. To participate, simply open the Blue Bikes app on a mobile device and select “Free Day Pass”. Blue Bikes is public transportation by bike. Owned and jointly governed by the municipalities of Boston, Brookline, Cambridge, and Somerville, Blue Bikes offers a fast, fun, and affordable transportation option. Today, users can ride any of the 1800 bikes to and from the 195 stations across the region. By the end of 2019, the municipalities will provide 3000 bikes and 300 stations for their residents, workers, and visitors. Blue Cross Blue Shield of Massachusetts is a community-focused, tax-paying, not–for–profit health plan headquartered in Boston. We’re the trusted health plan for more than 25,000 Massachusetts employers and are committed to working with others in a spirit of shared responsibility to make quality health care affordable. Consistent with our corporate promise to always put our 2.8 million members first, we are rated among the nation’s best health plans for member satisfaction and quality. Connect with us on Facebook, Twitter, YouTube, and LinkedIn. Motivate is the largest operator of bike share systems in North America—operating in eight cities including several major urban centers. Working with cities, Motivate has helped bring the benefits of bike share to more urban residents and visitors. To learn more, please visit here.